A brand new "Black" re-edition of Vash The Stampede from the popular series Trigun ! Kotobukiya presents an exclusive new version the popular Trigun character Vash The Stampede -The Gunman in Black- ! Vash the Stampede is the main character of the anime and manga series of Trigun created by Yasuhiro Nightow. Featuring the same highly detailed sculpt, this new version of Vash features a stunning black costume with special detailing that really makes it stand out. The overall impression of the figure is now much more serious than the original one. Vash's base has also been re-designed to fit the new color scheme. The figure itself is almost 19 cm tall at a 1/8 scale. As an extra display option, the statue can be displayed with or without the removable sunglasses. 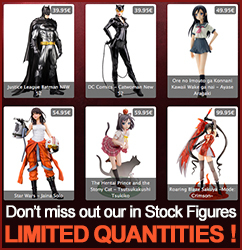 Vash looks great alone or alongside other Trigun ARTFXJ statues from Kotobukiya !